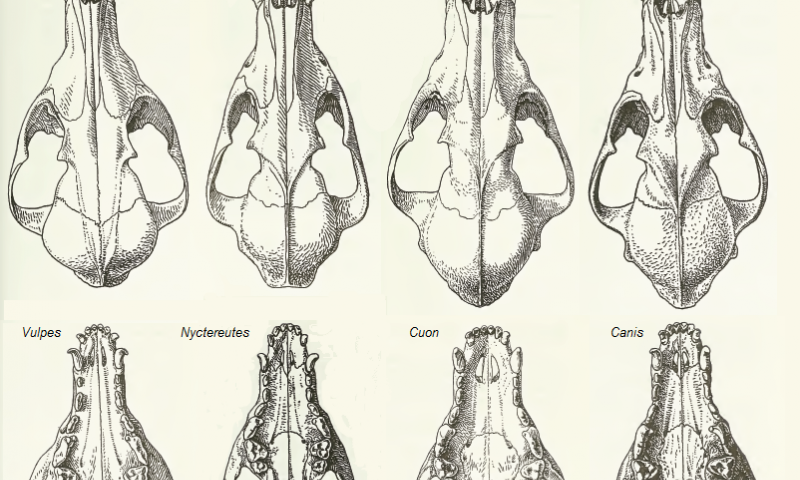 Skulls of various Canid genera; Vulpes (corsac fox), Nyctereutes (raccoon dog), Cuon (dhole) and Canis (golden jackal) Credit: Wikipedia. (Phys.org)—Over long spans, biodiversity is a fluid and shifting balance of species and influences. Species diversification occurs in response to a host of complex factors, both biotic and abiotic, and understanding them is a major challenge of evolutionary biology. A group of researchers in Sweden, Switzerland and Brazil have collaborated on a study of North American canids to show that competition from multiple carnivore clades is responsible for the ultimate demise of two extinct canid subfamilies. They theorize that the competitive processes driving these extinctions are more prevalent in species diversification than previously believed. The study is published in the Proceedings of the National Academy of Sciences. The North American fossil record provides abundant evidence for the evolutionary history of the dog family Canidae and of other major carnivores. The researchers analyzed around 1,500 fossil occurrences for 120 canid species from around 40 million years ago to the present; theorizing that competition from other species was a factor driving extinction rates, they also compiled data for five additional carnivore families including cats, bear dogs, false saber-tooth cats, and bears. They developed an analytical framework to invesigate whether speciation and extinction rates responded to evolution of body mass—a good approximation of diet for canids. The authors suggest that body size can indirectly correlate with diversification dynamics as increases in size predispose the development of hypercarnivory behaviors and selective feeding. These adaptive constraints place canids in danger of extinction by restricting their possible sources of food. Via a Bayesian analytic framework, the researchers have determined that the two extinct subfamilies that form the basis of their study were ultimately wiped out by the competitive effects of other carnivore clades, previously considered a rare occurrence, but increasingly regarded as an important influence on biodiversity. Climate change events are widely believed to be a main driver of extinction and speciation, but the study strongly suggests an important role for competition between different species with similar ecologies. Two biologic mechanisms drive clade replacement: passive replacement and active displacement. In the case of passive replacement, an incumbent carnivore clade prevents a competitor population from radiating. The competitor can only radiate once the incumbent carnivore clade declines. Active displacement is the process by which a clade's rise in diversity causes the decline of another clade by outcompeting for limited resources. "The demise of nonavian dinosaurs by the Cretaceous-Paleogene meteorite impact around 66 million years ago and the subsequent evolutionary and ecologic diversification of mammals provide an iconic example of passive replacement," the authors write. The authors found evidence for significant changes in speciation and extinction rates for the two extinct canid subfamilies, Hesperocyoninae and Borophaginae, suggesting strongly that the demise of a clade is driven by both its rate of extinction and its failure to originate. The researchers report that changes in in the speciation and extinction rates of the two extinct canid groups were strongly correlated with changes in diversity of multiple competitors. "Our results strongly indicate that competition among several clades of canids and other carnivores drove the changes in diversification rates and the replacement of entire clades," they write.